We all would agree that breathing is a necessary skill for survival. Most of us take it for granted and never give it a second thought. It is automated by our brain so we literally do not have to think about it. Did you know that there is a wrong way to breathe? When we are born we breathe using a muscle called the diaphragm. We deeply inhale and exhale through the abdomen. This is the correct way we should continue breathing throughout our lifetime. Over time with stress, poor posture and compensations in our body we lose strength in that muscle and the ability to breathe properly. Breathing isn’t the only function of the diaphragm muscle. 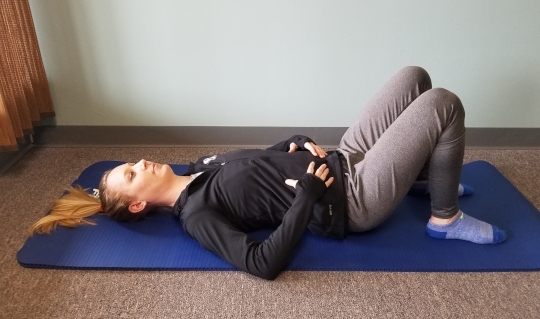 The diaphragm also puts pressure on the esophagus to prevent acid reflux and it increases abdominal pressure which is important for core stability. While the diaphragm muscle is not the only core muscle as there are many, it is a major one because we use it constantly. Breathing correctly can give your body a better foundation for function and movement in every activity that you do. Many people compensate with more shallow breathing from the chest and neck. This can cause tense, tight muscles (especially the scalenes and SCMs(sternocleidomastoids)), neck pain and even headaches. This combined with the weakness in core stability from not utilizing the diaphragm is a recipe for back pain. The good news is you can retrain your body to breathe correctly. Start by laying on your back on a flat surface. Bend your knees so that they are resting and relaxed. Take a deep breath in and feel your waistband or belt-line area inflating all the way around. You may want to lay your hands over your abdomen so you can feel the movement. Hold the breath for 4 seconds and exhale. Repeat for 1 minute focusing on the deep inhaling and exhaling coming from the belly. Start by doing this 3 times every day (only 3 minutes per day!) to start stimulating your core for proper function and movement. Performing this motion correctly is key because we will build onto this and use this technique in every other exercise we do.